Lee Hays Sing Out, Warning ! Sing Out, Love ! 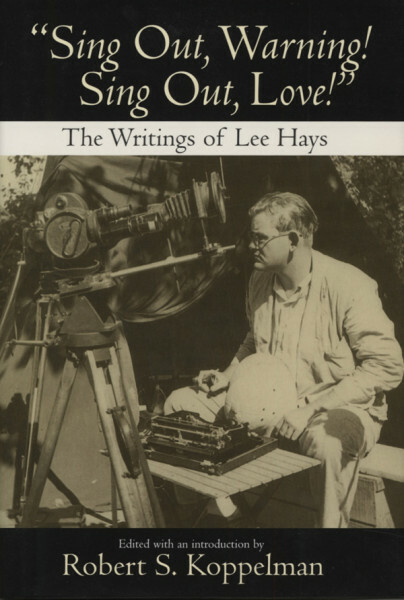 Lee Hays: Sing Out, Warning ! Sing Out, Love ! (2003/U.o.M. Press) English, Clothbound, 16x23,5 cm, 234 pages; Lee Hays (1914-1981) is remembered today as the bass singer of the Weavers (available on BCD 15930 Weavers: Goodnight Irene 1949-1953 4-CD/1-DVD Box-Set), the popular folksinging quartet that included Pete Seeger and was blacklisted during the early years of the cold war. But he was also a talented, multifaceted writer of prose. Robert S.Koppelman brings together a selection of Hays's published and unpublished literary output and places the author and his work in historical context. These writings reveal Hays to be an artist of deverse personal talents and deep social commitment. Article properties: Lee Hays: Sing Out, Warning ! Sing Out, Love ! Album titlle: Sing Out, Warning ! Sing Out, Love ! Customer evaluation for "Sing Out, Warning ! Sing Out, Love !"